French Riviera Villefranche Waterfront rental appartments Just a few steps from the beach and with stunning panoramic views from the balconies of this most photographed buildings, these two appartments must rank among the most romantic places to stay on the French Riviera. Both appartments can see 4 but 2 is better. 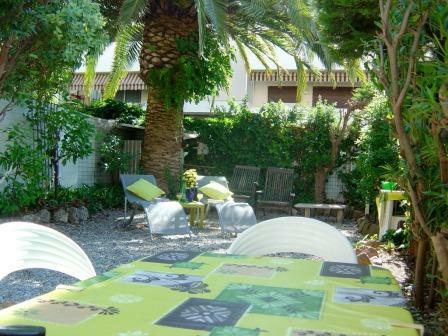 French Riviera Central Cannes: Delightful garden studio sleeps 2-4 just off La Croisette. Charming private garden and sun terrace. Very peaceful in quiet exclusive gated road with no noisy traffic and own parking. It even has a hot & cold shower under a secluded bay tree... perfect! Ideal holiday and conference accommodation. Some prices quoted below may possibly be negotiable. Inland Bagnol-en-Foret: 3 bedroom villa to rent sleeps 8 located in hilltop village near Grasse and inland from Saint Raphael. Currently long-term unavailable.